To look at Dave Daley, with his long ponytail, hooded sweatshirt, and lanky frame, you probably wouldn't guess a lot of things about him. For example, you probably wouldn't guess that he's in his 50s. Or that he serves as the main airplane mechanic in the small community of Churchill, Manitoba. Or that he is a proud Metis. Or that he is kind of a big deal in the dogsledding world. But all of these things are true about this unassuming-looking man, who at first glance looks more suited for Venice Beach than the Canadian sub-arctic. 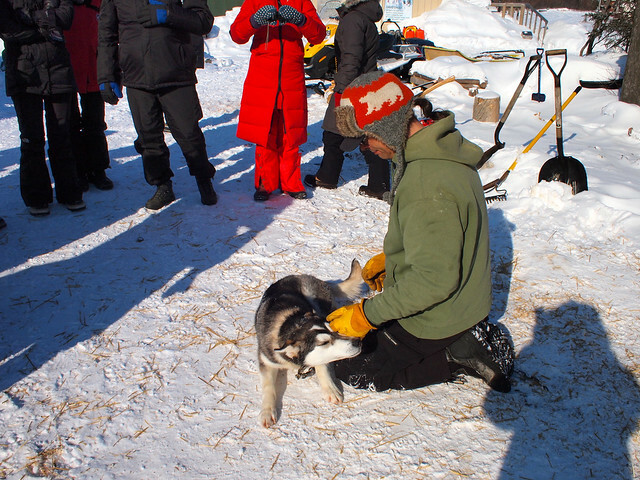 I met Dave just outside Churchill, where he introduced me and a cabin full of bundled-up tourists to his vast team of sled dogs at Wapusk Adventures. 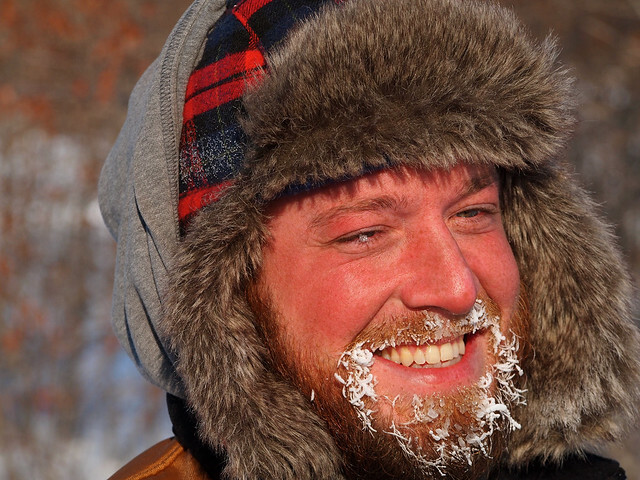 As a seasoned musher who even started his own sled race in Canada, Dave has a lot to say about the sport of dogsled racing. But, first and foremost, this man loves his dogs. “You never, ever kick or hit a dog,” Dave tells us, emphasizing each word with a staccato hand motion. “Ever.” Dogs, he says, have to view their musher as an alpha male; a part of the pack, and not a human telling them what to do. And no, he's not kidding. He even demonstrates this to us later when we head outside to meet some of his excitable dogs. 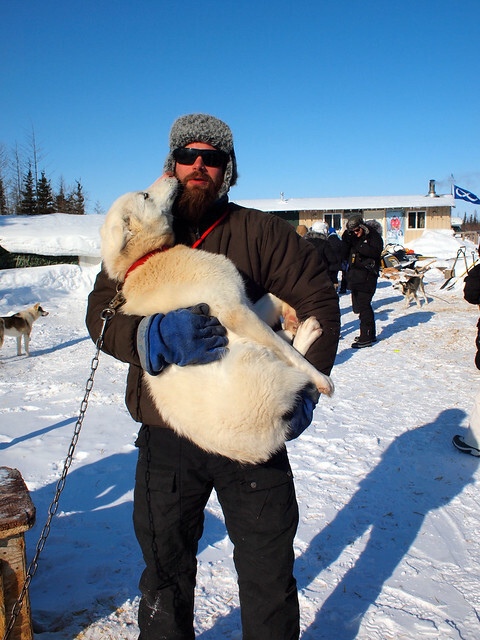 My experience at Wapusk Adventures solidified for me the opinion of dogsled racing that I formed last summer in Alaska — that it is NOT a cruel sport; that the dogs are crazy about running; and that the mushers often love their animals more than themselves. Dave picked up his dogs for a cuddle, tussled with them in the snow, and told us that winning the veterinarian's award after a long race meant more to him than coming in first place. And then, of course, after learning about Dave, his dogs, and the Hudson Bay Quest (the race Dave himself started years ago in Canada, and one he would go on to win a few days after I met him), it was time for us to get a taste of dogsledding ourselves. 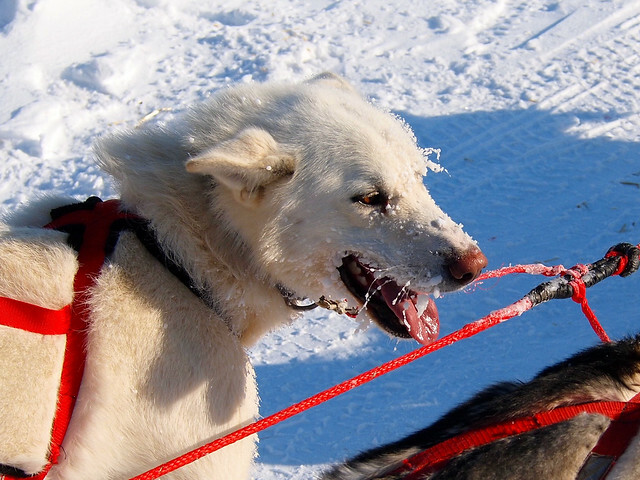 Wapusk Adventures is located out on the tundra of northern Manitoba, and Dave has set up a mile-long trail that tourists get to race around, pulled by teams of Dave's beautiful dogs. 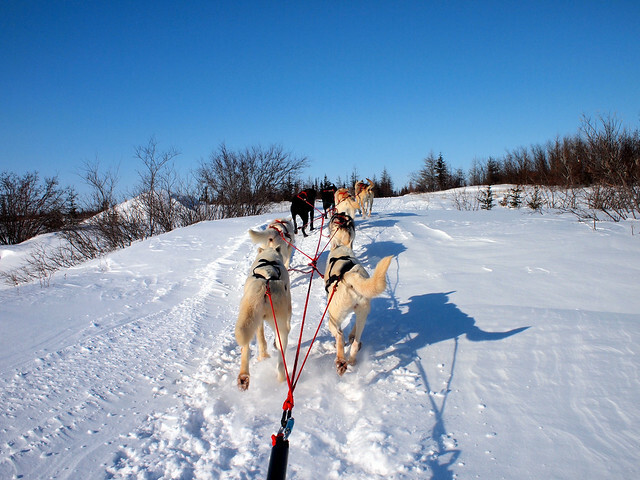 He calls it the “Ididamile” — a play on the famous Iditarod dogsled race that Dave's Hudson Bay Quest is actually a qualifier for. 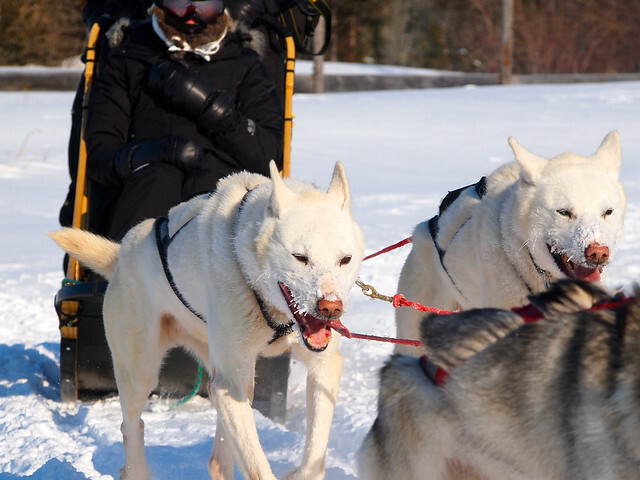 With two guests and an experienced musher on each sled, you don't exactly zip around the Ididamile — but that doesn't mean it's not fun. The dogs were so excited to run and the wintry setting was so perfect that none of us even minded the fact that our breaths were forming thin layers of ice on our scarves and (for the men and dogs) in our facial hair. 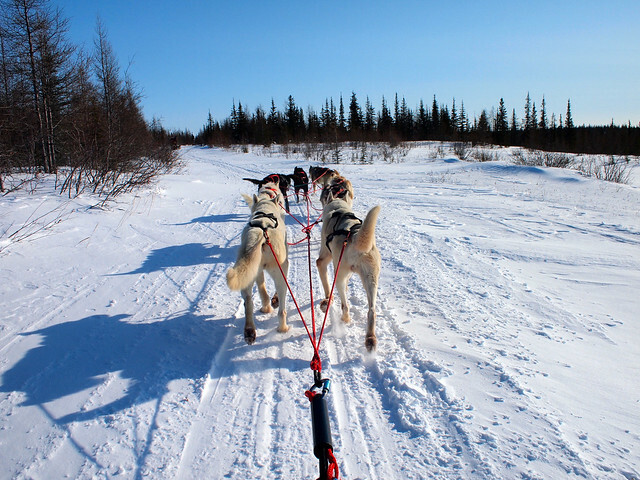 What do YOU think of dogsledding? Is it something you'd like to experience one day? *Note: I was a guest of Travel Manitoba and Frontiers North Adventures (and Wapusk Adventures) on this trip. But, as always, all opinions are my own. Wow I am so envious!!! This is high on my bucket list if I can ever force myself to go even further north in the winter! 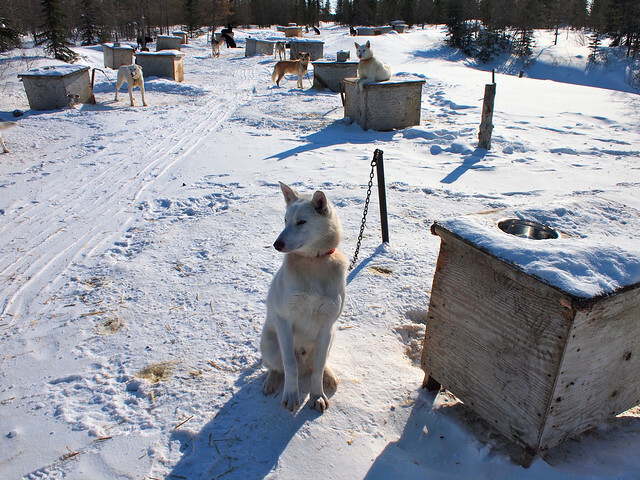 I spent 24 hours with sled dogs in Whitehorse at Muktuk Kennels in September of 2010 but there was an early snow so it was too mucky for a training run with the dogs. I stayed over in their B & B and helped feed and water them and we took some of them down to the river for a run. Great fun. Also was entertained by Frank Turner who owns the kennels and has won the Yukon Quest several times – what an interesting man. He loves his dogs too. That was a big enough thrill for me but to go for a sled ride would be just the best thing ever! Thanks for sharing!!! By the way if you are looking for a good book to read about dog sledding from a tourist standpoint try “Mad Dogs and an Englishwoman” by Polly Evans. 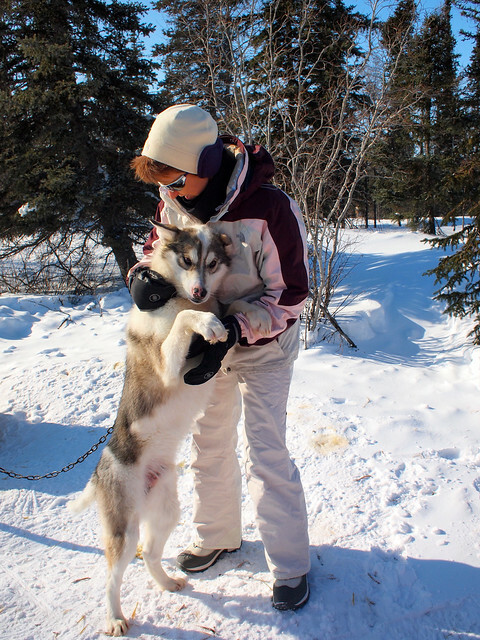 She talks about her time up in Whitehorse with Frank’s dogs – a great read! Still sounds like you had a fantastic experience with sled dogs!! Hopefully you’ll get another chance to go running with them! 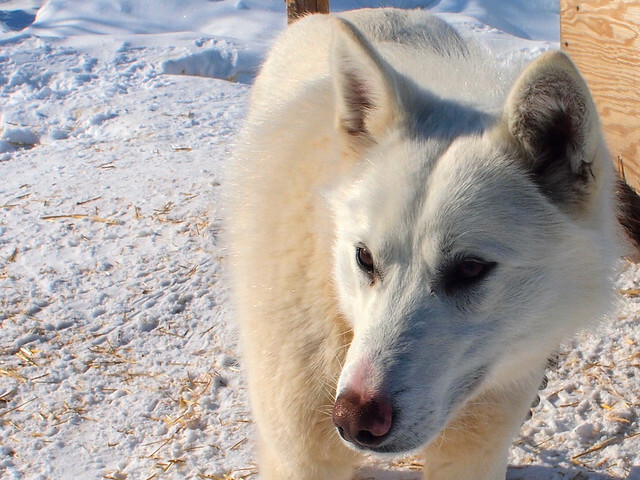 the great white north completely impressed me… and dog sledding was such a unique adventure. great capture of the moments… no doubt Manitoba was a special place..
Manitoba – and Churchill especially – is indeed a special place! Visiting Dave’s dog yard was definitely a highlight for me! Oh wow, that looks like so much fun! And the dogs really do look like they’re enjoying themselves too. I love that photo of the dog jumping whilst the rest are on the ground 😛 Fantastic timing! It took me a few tries to get that shot – but I’m glad I finally did. That dog was SO excited to run! It looks like so much fun! I’ve always dreamt of doing dogsledding. Glad you go to experience it! I’ve always wanted to do it “properly” like this, too. It was so much fun! Glad I could make your day with a post about dogs! I’ve just become a biggest Polish fan of the musher:-) I love the way he treats the animals (or rather the way you described he treated them). This is so awesome! Yes, Dave definitely loves his dogs! Bucket list!! Your photos are incredible, I love the action shots of the dogs. They’re incredibly beautiful animals and it looks like you had a once in a lifetime experience. Definitely a bucket list item for me, too! Glad you enjoyed the photos! Like the first comment I also visited Muktuk and had a pre-winter training run with a 4 wheel bike. I loved the dogs, gorgeous creatures and so well cared for. A proper run in snow would be fantastic to tick off one day. Great photos! I got a little taste of non-snow dog racing in Alaska last summer. But it’s definitely not the same as watching the dogs do their thing on snow!! I feel like such a bad Canadian, I never went dogsledding 🙁 I really hope I can go soon! Gorgeous photos. You should definitely put it on your list! So much fun. This is the post I was so looking forward to hearing about. 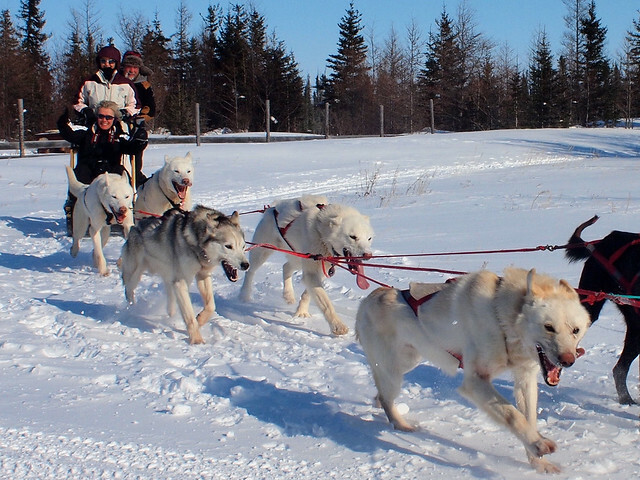 I’ve wanted to go dog sledding forever and I can’t wait, can’t wait to do it! It’s such a fun experience – both the sledding itself, and playing with the dogs before and after. I’m not a dog person at all, but I loved every second of this. Highlight of my trip to Alaska: Helicopter onto a glacier. 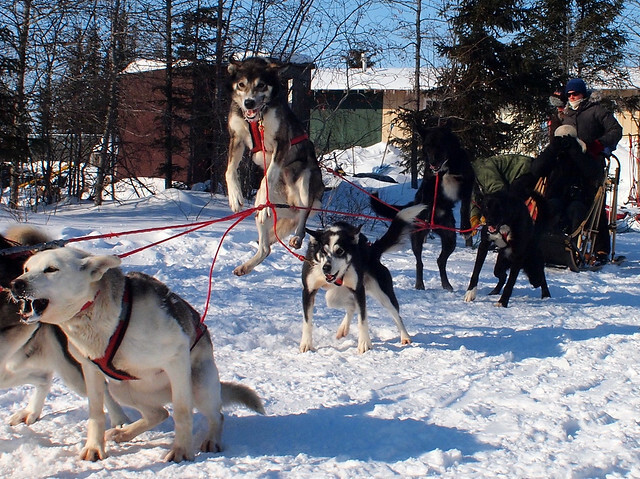 Sled with dogs. Die happy. Repeat. So cool! Seems like a wonderful place! Haha, yes, your fingers (and face!) certainly get cold during that ride. Great to hear that you’ve been to Dave’s place, though, and enjoyed it as much as I did! To all the none-believers…. Believe this woman, mushing is an amazing experience. More it’s an amazing life changing experience. I had worked in the “real” world (farm-hand to mechanic to retailer to Drug, Alcohol, Substance Abuse Rehab to Sexual Abuse Therapy) since I was 12 & @ 34 all I had to show for it was a messed-up back and a pretty sour outlook. I moved to the “bush”, hunted, trapped, fished and gathered. Remembering my Grampa’s stories of freighting with dogteam for HBC, I did a little research and got 3 dogs, made an “ootawpunn” from old toboggans I found at the dump, made some harnesses out of old horse halters and……. Well….. today I have 4 rather futuristic old fashioned sleds, 2 very pretty basket-sleds, 43 custom made harnesses, polyethylene gang lines and 14 Husky dogs & 4 Sprint(designer)dogs. I can relate to the quotation “The more I know people, the more I love my dogs.” They are amazing creatures. Fact, they love working. Fact, they are loyal. Fact, they are loving. Fact, they earn my respect, not demand it. My wife grew up in Churchill. She knows Dave and the others that created the HBQ & is related to some of them. I’ve never met Dave but we know who each other is. To an extent or other I am envious that he gets to mush for a living for approx 2 months more than I do every year. That being said, I am happy that he gets to share our lifestyle with wonderful people who appreciate life and recognize there is a difference between existing and living. I happened upon your post @ a time in my life where your positive experience has provided me with a much needed boost. Your pics, your comments, your attitude(shown by your pics and attitude) all made a song to my heart. Thank you so much. Thank you so much for the great comment, William! I’m glad this post gave you a little boost today. Have you ever tried to mush yourself? Oh wow, and dogsledding trip in Greenland would be incredible! And no, I haven’t been able to try mushing myself yet – so I suppose that means I’ll definitely have to go sledding again!